Abstract: This paper proposes a multi-agent cooperative intermodal freight transport planning approach for multiple intermodal freight transport operators (IFTOs) in the control of container flows when the aim is to minimize the overall freight delivery cost for serving certain transport demands. Each IFTO employs a model predictive control approach in planning intermodal freight transport. 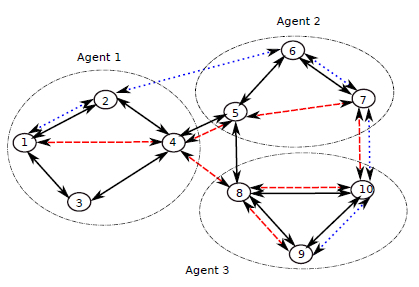 Based on the distributed model predictive control methodology, a cooperative planning approach is proposed by decomposing the augmented Lagrange formulation of the joint intermodal freight transport planning problem into subproblems that are then cooperatively solved by the IFTOs through iterative exchange of planning information. A simulation study on cooperative intermodel freight transport planning illustrates the potential of the proposed cooperative planning approach. Reference: L. Li, R.R. Negenborn, B. De Schutter. Multi-agent cooperative transport planning of intermodal freight transport. In Proceedings of the 17th International IEEE Conference on Intelligent Transportation Systems (ITSC 2014), Qingdao, China, pp. 2465-2471, October 2014.